A big day is coming up for me. A day I’ve been thinking about for a very long time: my first try at a 100-mile foot race. I chose the Leadville 100 for many reasons, but the main reasons were that it is relatively close to where I live (~2.5 hours away) and I love being “up high” in the mountains. If you search the Internet blogs about this race, it is hard not to find the words “sufferfest” and “grueling” when reading runner accounts of their experience at this race. Slightly intimidating for a first timer. I think the most common two questions I’ve been asked during my training are: how long do you expect this race to take you? and what are you going to eat? My answer to the first question remains “I just want to finish the race”. To the second question, I have a variety of goodies planned. Here is the majority of my ‘Plan A’ items. 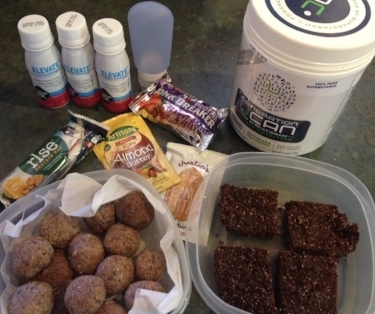 While I am not showing or describing all of the details of my nutrition and hydration strategy here, I wanted to show that the main source of my planned calories will come from the Generation UCAN superstarch, a few homemade items (with a powerhouse of ingredients! ), nibbles from a few packaged protein bars I like, a couple homemade ‘gels’, nut butter, and the ThorneFX Elevate energy shots which contain adaptogens and green tea extract. Notice there is not a mound of simple sugar products in the Nutrition "Plan A". I do have a Nutrition "Plan B", which all ultra runners should have (although, it’s surprising that so many don’t even have a Plan A!). Simply put, the Plan B involves flexibility. Just like with a pacing plan, at some point you may have to adjust based on The Unknown. In my quest to learn more about how other runners have fueled at the LT100, I have read countless reports of stomachs gone bad… leading to nausea, vomiting, and the ultimate DNF. It is very possible this will happen to me, but I am prepared to not throw in the towel right away if and when this should happen. My Metabolic Efficiency Training has served me well to this point. I have not been on the ‘low carb, high fat’ plan this time around, but I have been on the ‘controlled carbohydrate’ plan. A recent Metabolic Efficiency Assessment showed that at my anticipated paces at Leadville, I will be burning anywhere from 64% to ~85% fat. The more I can preserve my carbohydrate stores, the better. The more I can rely on my fat stores as a fuel source, the better. Of course, hydration status greatly influences how we feel, so this is an essential component to being able to finish without a major breakdown. However, compared to ultra runners who are not as metabolically efficient (and believe me, there are many) and who require 300-450 calories per hour, perhaps my nutrition plan will delay or prevent the ‘stomach gone bad’ incidents.